Can I get some samples of these business window envelopes? I would only need a few just to see if they will work. Can you tell me how many envelopes come in a box ? Each pack has 25 envelopes. We wouldn't suggest putting our window envelopes through that heat, it might melt or bend. Sorry for any inconvenience this may cause. We don't do any custom printing. However, we do have free templates you can use to customize your envelopes here: http://www.jampaper.com/Templates.asp. Just look for the #10 Envelopes under the Envelopes section. Let us know if you have any additional questions. do you sell self sealing envelopes and can you imprint a return address on them? What would be the charge? Here are our collection of envelopes with a peel and seal: http://envelopes.jampaper.com/search?p=Q&amp;lbc=jampaper&amp;uid=215763945&amp;ts=custom&amp;w=self%20adhesive%20envelopes&amp;isort=score&amp;method=and&amp;view=grid&amp;af=color:blue%20color:yellow%20color:red%20color:pink%20color:ivory%20color:green%20color:grey%20color:white%20material:paper Unfortunately we do not have a printing service. Here's a directory we provide: http://www.jampaper.com/printers-near-you.asp Hope this helps! We do not do custom printing, sorry for any inconvenience this may cause. is the bright hue paper different from astrobrights? Hello, They are technically two different types of paper, but are so similar there is virtually no difference between the two. Both are brite hue papers. Thanks! Can I order these with a preprinted return address? Same mail. But perfect for your business. Our Window Envelopes are taken more seriously because they offer a neat and tidy presentation and a clear pouch to display info. Instead of hand addressing each envelope, simply align the pre-typed address with the see-through window slot. You save time while simultaneously giving your mail an official look. So if you’re sending business mail, buy window envelopes, they're a must have. 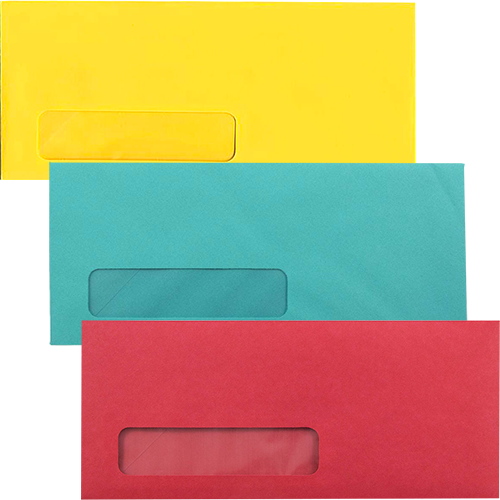 And just in case you don’t want to take the ordinary route, our #10 Window Envelopes are offered in a variety of vibrant colors. These colors are so bright, you can be sure a single window envelope won’t get lost and the mail. Your future customer will be yearning to know what's inside. Our #10 window envelopes are a business essential. Window Envelopes Sizes include 4 1/8 x 9 1/2. We also have special window envelopes that are recycled and made from 30% post consumer paper which include our Brite Hue shades.